Linda Lael Miller’s Fun July Prize Package! With her flair for stylin’ western, Linda Lael Miller has selected this trendy Blazin Roxx tote for the grand prizewinner in her June contest. 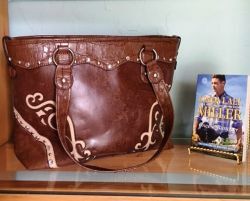 The faux leather brown bag is adorned with scrolls, rhinestones and silver-tone studs, with elegant paisley fabric lining, just the kind of accessory Grace Emery would carry in Linda’s Carsons of Mustang Creek launch book, ONCE A RANCHER. Linda will send a copy of the book to the winner, as well as three additional readers.